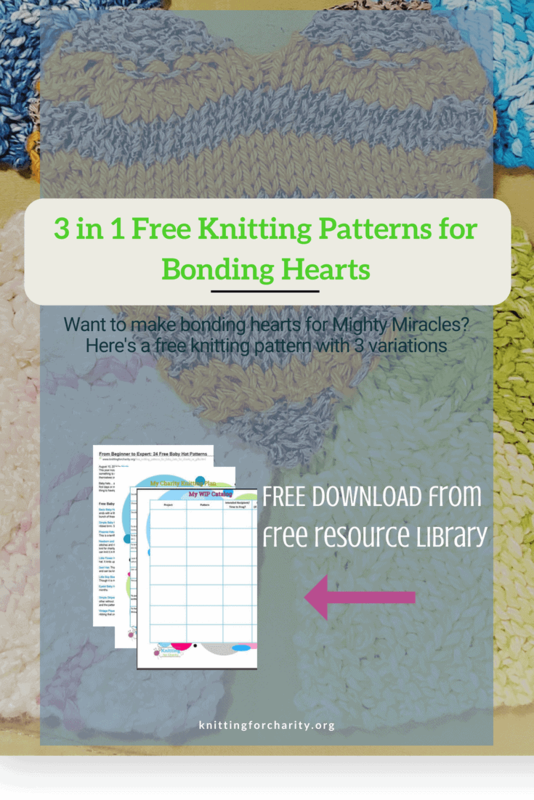 I’m so excited to offer my knitting friends these patterns for bonding hearts! If you don’t know what bonding hearts are, be sure to check out my article on the Mighty Miracles Foundation. In a nutshell, bonding hearts allow parents of premature infants to bond with them while they are in the NICU. 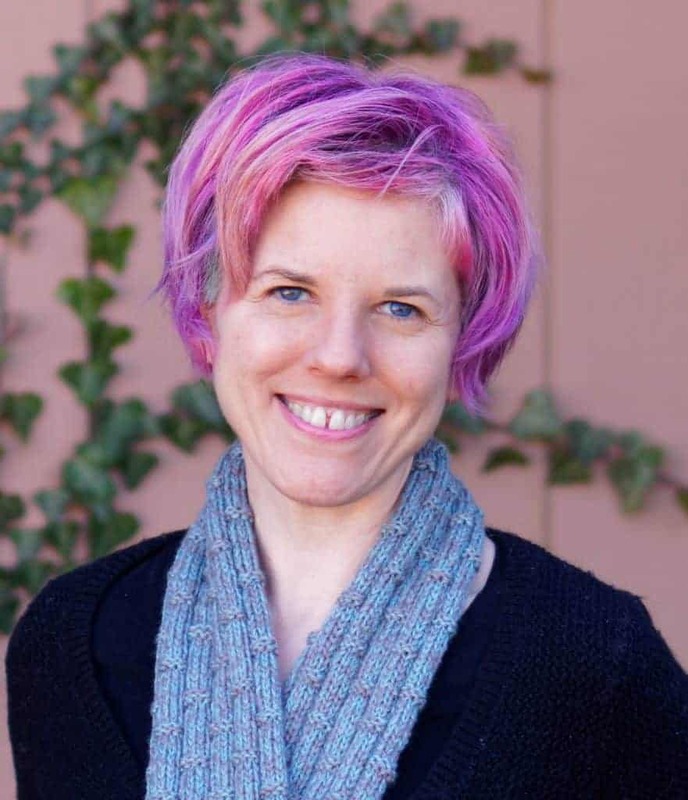 One thing I learned from talking to Amanda Dickinson, MMF director, is that parents of NICU preemies don’t get to spend a lot of time holding their newborns. How sad is that? Imagine having a baby that you can barely hold. It’s heartbreaking. That’s why bonding hearts are so important. It gives parents a sense of involvement and allows their babies a chance to get to know them, even in their absence. When Amanda shared her story with us, and told us about her care packages, the first thing I wanted to know (of course!) was whether bonding hearts could be knitted. She assured me that they absolutely could. 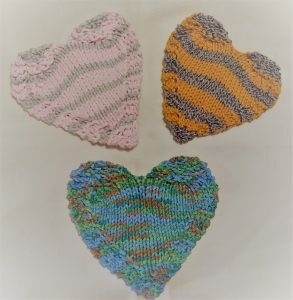 The only two guidelines for yarn-crafted bonding hearts is that they should be about 5” tall, and they must be made with cotton yarn. As it turns out, Ravelry hosts a terrific pattern that meets this requirement. It’s called the Hugs and Kisses Heart. It features adorable cabling that creates a pattern that looks a little like a combination X and O. If you love cabling, this could be a great way to proceed. So I decided to attempt a version of this pattern without the cables. 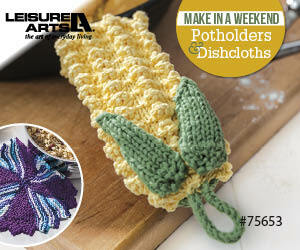 My first variation of this pattern simply replaces a few rows of the pattern with non-cable stitches. In all, seven rows are altered. For all the other directions, just follow the first pattern. The one thing I don’t like about the variation above is that you have to follow the pattern pretty closely to create it. It wasn’t something I could just whip up while watching TV or a movie. I wouldn’t want to try knitting it in church, either! So I decided to create an entirely-stockinette version of this pattern, with only the point, borders, and top in more of a garter stitch. I find this pattern a lot easier to memorize. For those of you who enjoy zoning out with your knitting and who want to make hearts… this is the pattern for you! Row 3 (wrong side): Knit. Row 7: K3, P2, K3. Row 9: K4, P2, K4. Row 11: K4, P4, K4. Row 13: K4, P6, K4. Row 15: K4, P8, K4. Row 17: K4, P10, K4. Row 19: K4, P12, K4. Row 21: K4, P14, K4. Row 23: K4, P16, K4. Row 25: K4, P18, K4. Row 27: K4, P20, K4. Row 29: K4, P20, K4. Row 31: K4, P18, K4. Row 33: K4, P14, K4. Row 40: K2tog, K1, K2tog. No need to turn; just slip the right-most 2 stitches, one at a time, over the first stitch on the needle. Break yarn and secure end to make a nice smooth edge. Row 40: K2tog, K1, K2tog. Slip right-most 2 stitches over the first stitch on the needle, one at a time. Break yarn and secure end. For both bonding heart variations, you’ll want to wet-block the hearts to get them nice and flat. I also recommend washing the hearts in hot water before you send them, since they will be used for preemies. 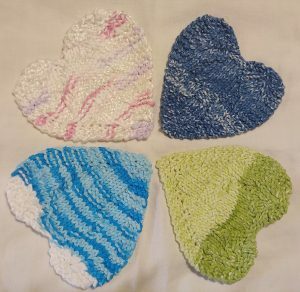 I recommend using a worsted-weight cotton yarn for these hearts. You can use a slightly thinner yarn; just know that it’ll result in a smaller heart. I hope you become as hooked on these bonding hearts as I’ve become! For a PDF of this pattern, click the button below to subscribe to the Knitting Nuggets Newsletter and get access to the Free Resource Library. Already a subscriber? Click this link and enter your password for immediate access!